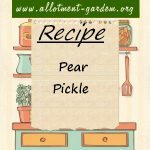 Recipes using pears in the ingredients. Recipe for Mulled Pears. An impromptu dessert that would work really well as a trifle base. As an added bonus you get to drink the Mulled Wine too.